Upward pressure on home prices is based on one basic dynamic: more demand than there is supply to satisfy it. 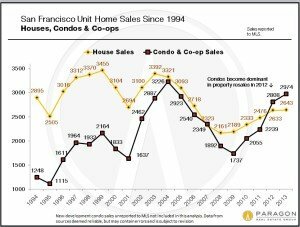 Various factors can supercharge demand, such as extremely high rents and low interest rates, which make homeownership more attractive, as well as a sudden, large influx of new, affluent buyers (our high-tech boom) piling into what is basically a relatively small, inventory-constrained market. When there are 5, 10 or sometimes 20 qualified buyers chasing after every attractive, reasonably priced, new listing, prices typically go up, sometimes quite quickly. Last year, after the spring feeding frenzy, the market generally stabilized through the end of the year: It continued to be a strong market by any measure, but prices mostly plateaued, albeit often at new peak levels. We recently speculated on tentative signs that suggested a further market normalization, but now the indicators are pointing in a different direction. The inventory of homes available to purchase on any given day is even lower than before last year’s furious market; buyer demand has emerged from its midwinter hibernation like a hungry bear; and prices are under increasing pressure once again. 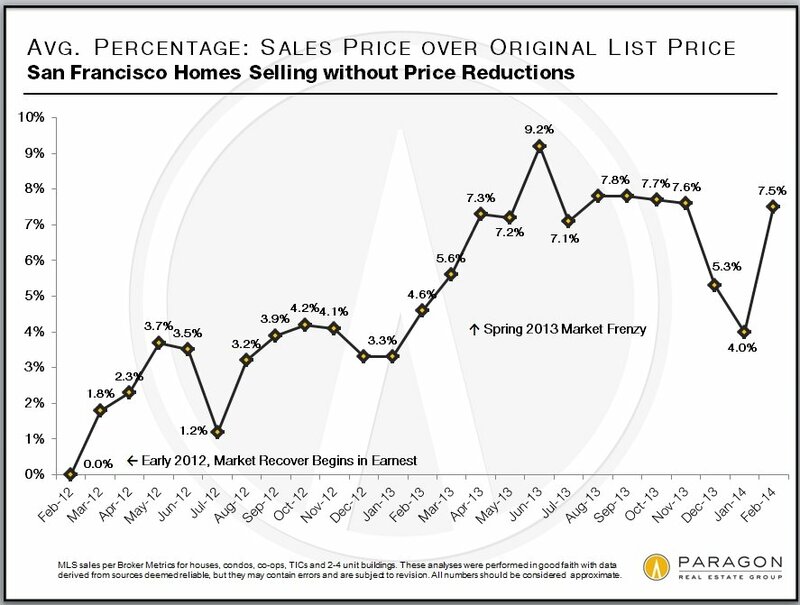 The spring selling seasons of 2012 and 2013 saw huge spikes in home price appreciation. Now we enter the third spring since our market recovery began in earnest, and the desire to live in our small, beautiful, expensive city continues unabated. We shall see how it plays out in the coming months. There is an aspect of seasonality to median home prices – typically up in spring, down in summer, up in autumn, down during the holidays — which explains some of the fluctuations seen on this chart, though the upward trend since 2012 began is very clear. It’s common for median prices to fall in January and February: This reflects offers accepted during the holiday season, when the higher end of the market often checks out. 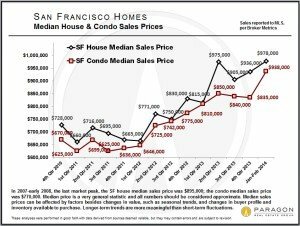 But not in 2014: median sales prices for houses and especially condos jumped dramatically in the past two months, which may suggest another white-hot spring market. 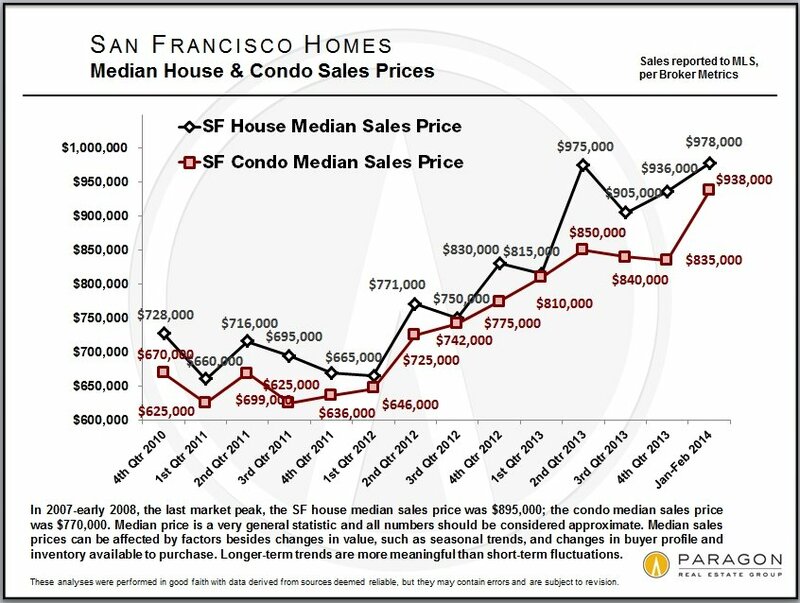 Note that median sales prices are often affected by other factors besides changes in values, such as inventory, and longer term trends are much more meaningful than short term fluctuations. 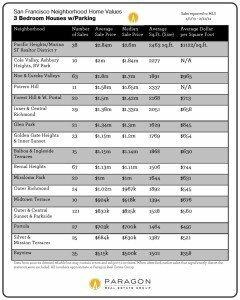 This is one of 8 updated tables on San Francisco home values by median and average sales price, and average dollar per square foot. The full analysis looks at houses, condos and TICs by neighborhood and number of bedrooms throughout the city and can be found via this link below. 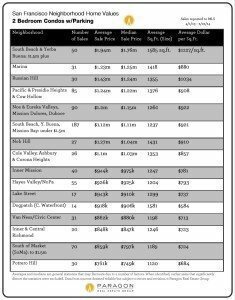 All general statistics typically disguise a huge variety of values in the underlying individual sales, but can give a good idea of comparative home values. 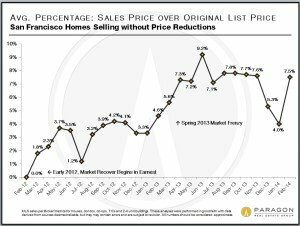 Last month, we pointed to the decline in the percentage of sales price over list price for homes selling without price reductions in December and January as a possible indication of a cooling market. February completely reversed that trend (though one should never make too much of one month’s data). 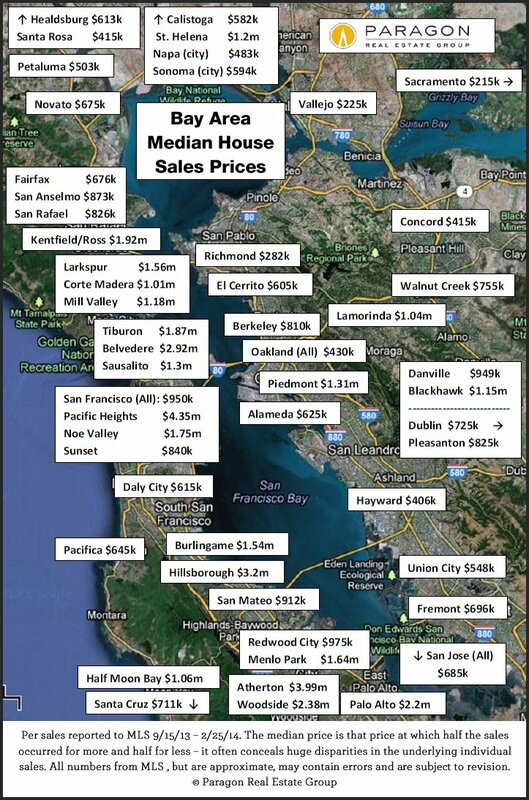 This map illustrates overall median sales prices for houses in cities all over the Bay Area. 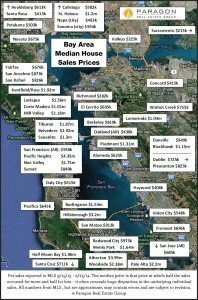 In San Francisco, median prices by neighborhood can vary from under $500,000 to over $4,000,000; other cities will often display a similarly wide range of home prices in different neighborhoods. 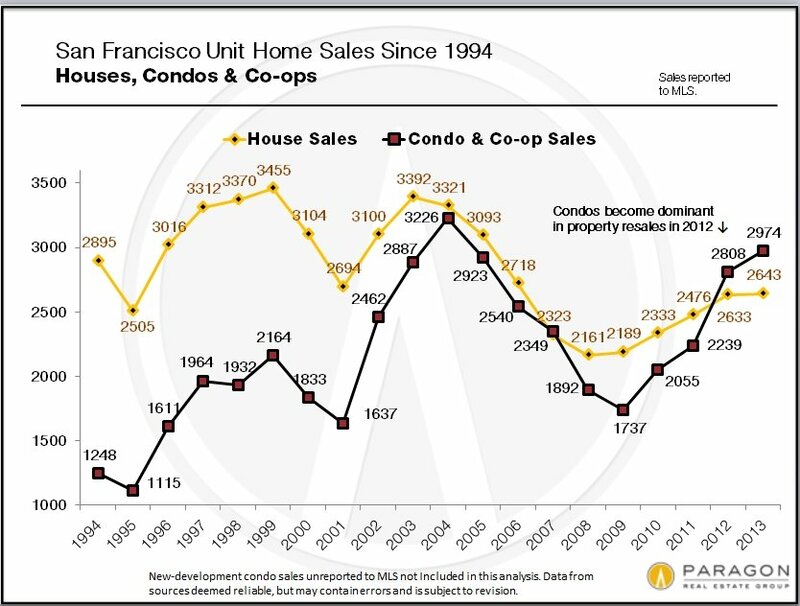 As shown in this first chart, condo sales now outnumber house sales, a trend that will only continue to accelerate as new condo developments are built. 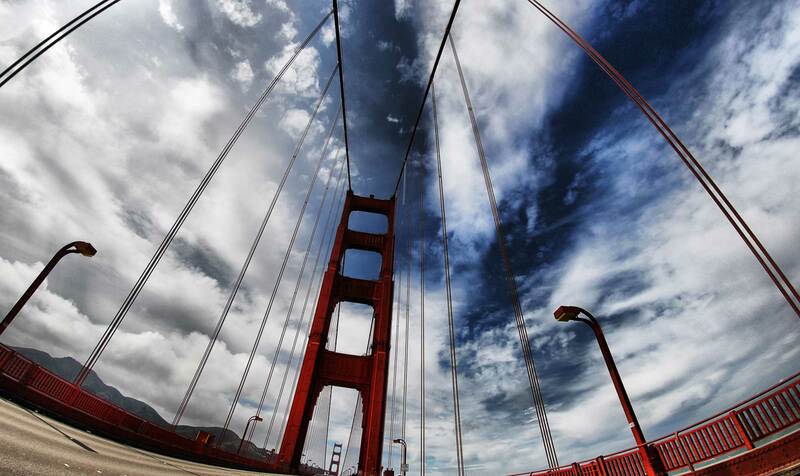 Very few new houses are built in San Francisco and they generally simply replace older homes. 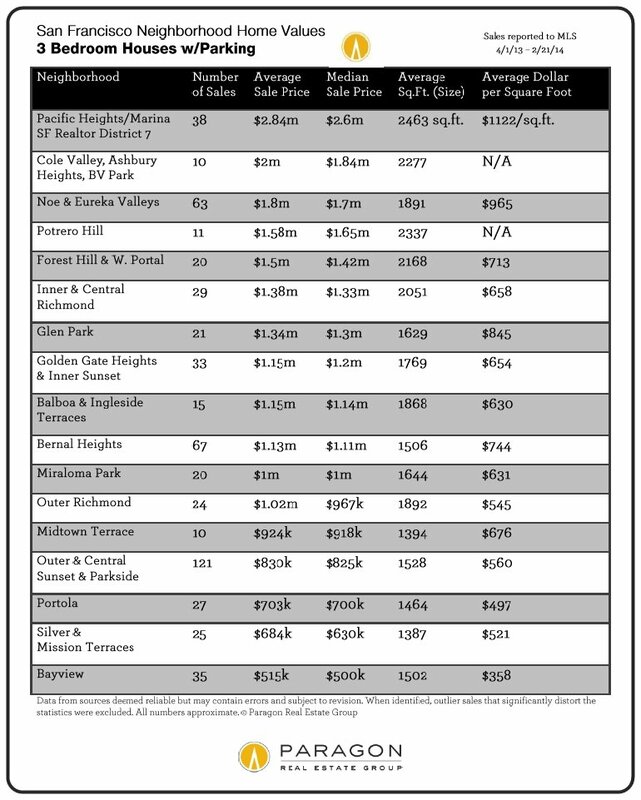 This link illustrates the decline in sales for TICs and 2-4 unit buildings, which is occurring due to a variety of factors, including financing issues, rental units converting to TICs, TIC units converting to condos, and complex tenants’ rights and eviction issues. All numbers relate to a January 2000 value of 100: A reading of 182 signifies a home value 82% above that of January 2000. 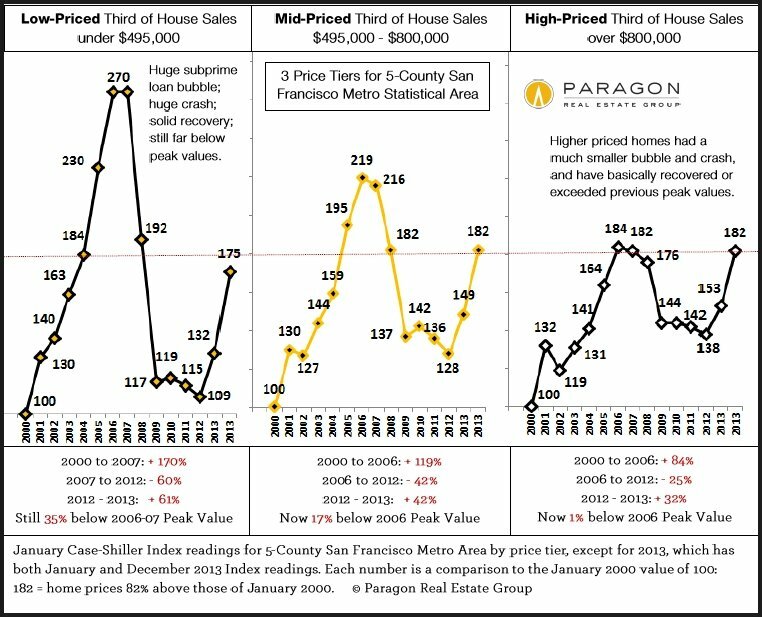 These 3 charts illustrate how different market segments in the 5-county SF metro area had bubbles, crashes and now recoveries of enormously different magnitudes, mostly depending on the impact of subprime lending. The lower the price range, the bigger the bubble and crash. The upper third of sales by price range (far right chart) was affected least by the subprime fiasco and has now basically recovered peak values of 2006-2007. 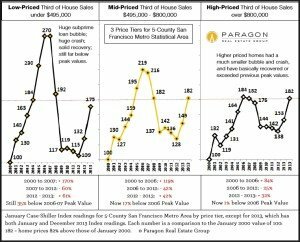 In the city itself, where many of our home sales would constitute an ultra-high price segment, if Case-Shiller broke it out, many of our neighborhoods have risen to new peak values. 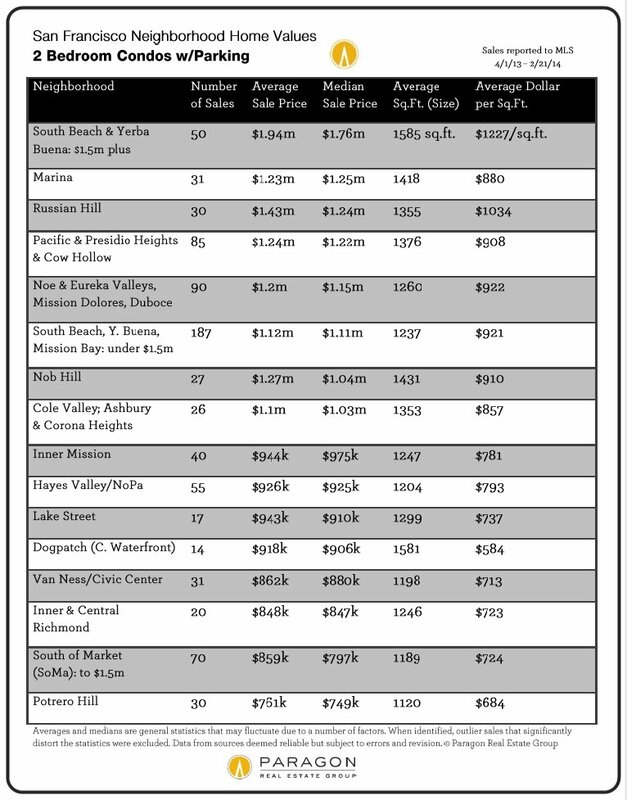 The lowest price segment (far left chart), more prevalent in other counties, may not recover peak values for years. If one disregarded the different bubbles and crashes, home price appreciation for all three segments since January 2000 is almost exactly the same, in the range of 75% to 82%.